We spoke to Ed Burkes, winner of the Jonathan Vickers Fine Art Award 2019, about island life, how it's influencing his artistic practice and his plans for his upcoming residency in Derbyshire. Foundation Derbyshire and Mall Galleries are pleased to announce Ed Burkes as the winner of the eighth Jonathan Vickers Fine Art Award. 21-year-old Italian artist Andrea Santi wins the £5,000 Alfred Teddy Smith & Zsuzsi Roboz Award for a pencil drawing of her mother. 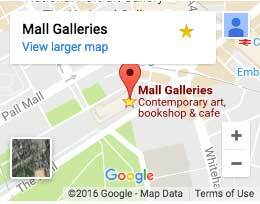 What did our 'Art Expert in Residence', Estelle Lovatt, think of her first Mall Galleries residency day? Applications are now open for the 2019 John Busby Seabird Drawing Course Bursary. Read about the impact it has had on the 2018 bursary winners.